Whether you’re from Canada, the United States, Kenya, or somewhere in-between, it’s always a good time to be thankful! This decorative tree is both cute and meaningful. It will remind you and your family to be thankful for all the blessings God has given you this year. Wrap the wide ribbon around your tin can, jar, or vase. Tie the ribbon in a bow, knot, or glue it to the container. This step can really make the tin can pretty, while a vase may not need a ribbon.a) If you are using plaster or clay, take the plaster and scoop it into the bottom of the can or jar. Stick the branches into the plaster so they are standing up and make a little tree. Let it set for a few minutes, so the plaster can harden. If you are using rocks or sand, put the branches in the jar or vase first and arrange them to make a little tree. Then carefully pour sand or small rocks into the container to keep the branches steady. download our free leaf-pattern printable. Once you have a bunch of leaves cut from the paper, grab your hole punch and the narrow ribbon. Carefully hole punch each leaf at one end, and cut your narrow ribbon into smaller pieces (about 3 in or 7.5 cm long). Then pull the ribbon through the hole and tie the ends together, making a loop to hang your leaf. Using your markers, write something you are thankful for on each leaf. 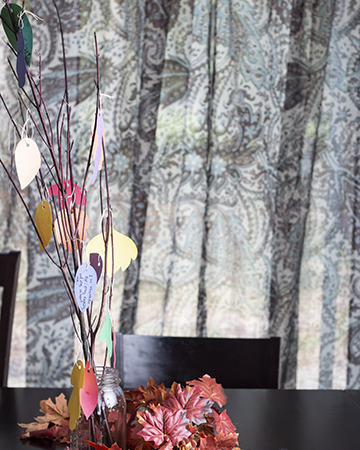 Hang the leaves on the ends of your branches to make a little thankful tree!